Finally, a clear explanation of how the bailout will work - as well as a review of the basics behind the Fed and the intricate financial instruments on Wall Street. Skip the first 15 seconds if you're in a hurry. The vocabulary has been watered down slightly from the normal jargon of the Dept. of Treasury and Wall Street gurus, but it's still accurate. Indeed, they've done a tremendous job in explaining the details. If you been puzzled by collateralized debt obligations (CDOs), swaps, derivatives, mark to market, and other core concepts associated with the bailout, this should make it all clear. If I'm not mistaken, the voice is that of Henry Paulson, Secretary of the Treasury - or is it Alan Greenspan? Watch this while relaxed. Hum a little. This will help. I'm not kidding - it's amazing how meaningful some of the statements in this video are, so strangely aligned with the messages emanating from the White House and Wall Street. Maybe they are much more into religion than I thought? I especially recommend the middle portion, about from about 2:45 to about 4 minutes into the clip. Nice parallels. Some of you wonder why I would deviate from my normal LDS religious discussions to deal with something so secular as the 700 billion bailout. Basically, it's because LDS religion and Christianity in general need political freedom to survive. They are highly vulnerable when states move toward socialism and its ultimate fruit, totalitarian government. The so-called bailout is express-track socialism, very similar to the failed National Socialism that Germany tried, with an increasingly powerful government working with big business. It's redistribution of massive amounts of wealth - mostly your wealth to the few big boys on Wall Street who are "too important to fail" or rather, too important to face the consequences of their mismanagement and fraud. But it's not just money they are asking for, it's massive power. Power into the hands of the people that created the mess so they can now "regulate" financial markets and ensure confidence. So we let them get away with this, open the flood gates for a power grab and wealth grab unprecedented in history, and we'll be creating a pathway for floods of new debt and corruption to erode the foundations of our economy and liberty. When we are all poor and utterly dependent on Big Brother for our weekly rations in a Marxist dream state, the power to control our property will also become the power to control our thinking and how we raise our kids. We can't trust these guys with our money - how can we trust them with the minds of our children? In the end, the sacrifice of personal liberty on the altar of Wall Street greed is less about bail than it is about Baal. Ultimate power: I say we keep it in the hands of the people, not Wall Street. If you agree, call your officials in Washington today and tell them to reject the bailout. To reach the House or Senate, call 202 225-3121. Your voice matters. On the other hand, if you think a few wealthy dudes on Wall Street can be trusted with a $700 billion credit card, allowing them to give money to China or almost anyone else with almost no oversight, then go ahead and call, too. Just be sure to use this special phone number for supporters of the bailout: 202 225-312. It may take a while to get through, so be patient. Very patient. With grief and shame, it is time for me to come out and confess a terrible dark secret you might not have guessed: I'm the one responsible for the current financial crisis. Yes, it's entirely my fault. It's time for me to stand and openly take full responsibility for this mess, and to take the full consequences that must be dished out as a result. Lehman Brothers Chief Executive Richard Fuld, recently "took the blame for the company's staggering second-quarter loss . . . This is my responsibility" he stated back in June. Now, with the complete failure of Lehmann Brothers, he had to accept the consequences for his guilt -- in the form of a $22 million award. And that was just for being partially responsible for the crisis. I'm fully responsible and am prepared to accept the total burden that is my due. It's called Wall Street justice, and it's time it's dished out my way. Just hope this bailout package gets passed quickly so I can get my piece of the consequences pie. A big piece, after all, since I'm taking the full blame for this fiasco. For those longing for the good ol' days of shadowy conspiracy theories involving Washington and Wall Street instead of daylight robbery, there is hope. We still have the opportunity to speculate about vast quantities of lobbying money, secret donations, promises of support and power, or maybe even blackmail to get so many politicians to completely ignore the outcry of Americans against the bailout of Wall Street "banksters." Whatever the price, it was surely a sound investment for those living in Bankster paradise, about to receive hundreds of billions of dollars from us poor folk who are already overwhelmed with debt. The audacity of asking us, with a straight face, to give them so much money without supervision, with no oversight at all, making the Banksters and their man in Treasury a law unto themselves, is simply outrageous. Almost as outrageous as the claims of the Gaddianton robbers in the Book of Mormon (e.g., the epistle in 3 Nephi 3 of Giddianhi to the Nephites with a message much like that of the Banksters: give us everything - it's for your own good). But their man stared us down, said we're paying the bail. Their stock may topple, but they'll be popping the bottle. Doing it an your dimes. Make that a few trillion times. . . .
American politicians sound so great. Wonderful words, lots of them, that sometimes sound so great that I might even vote for them, if I thought they could be trusted. Trust. It's what makes relationships, businesses, and even nations work. When someone isn't trustworthy, there's no sense dealing with them - contracts will be violated, loopholes found, theft will occur. You just can't deal with dishonest people and come out unscathed. When people can't be trusted, trouble follows. Eternal vigilance is the price of liberty because we have to always be watchful for the untrustworthy who crave power. The beauty of the Constitution is that it recognizes that humans can't always be trusted and thus sets up limitations to the power of government to keep it small, to keep its power diffuse and contained, with numerous checks and balances to limit what one corrupt man can do. But we've jettisoned much of that. Now we allow one man to declare and wage war, without authority. We allow a group of nine to essentially create laws, redistribute wealth, and even turn the sanctity of life on its head, and we think our only hope to restrain judicial license is to hope for judges to die so new usurpers can be appointed. Now we are asked to place the future of this nation into the hands of one man with obvious ties to the biggest special interests on earth, a man who tells us that he needs a $700 billion credit card without oversight so he can do whatever it takes to fix this crisis - because his company, his friends, his allies need our money, and lots of it. Man, this takes all the fun out of conspiracy theories. All that conspiracy theory stuff about hidden agendas, secret oaths, politicians taking money under the table, the secret influence of the mega-rich on government, the dark machinations of the wealthiest in the world, the gruesome power of the big bankers and their cronies expressed through tangled webs of alliances - it's all heady and exciting stuff, and it may soon be gone forever, if we don't act fast and demand that these guys start being secret again. Frankly, all the mystique is gone when the former CEO of one of the companies that runs the financial markets and got us into this mess comes before Congress and tells us that "Dah boyz up dah street need $700 billion protection money, and they need it now, no cops, no oversight, nuttin, just fork it over now, or you're all gonna suffer. Jus' get me da money, and it will all be good. Trust me.." No need for a sleuth to scurry around sorting through slivers of evidence to solve a midnight crime without witnesses - this is robbery in broad daylight by a gang that feels no need to hide. He is asking the government to put a gun to our heads and demand about $3000 from every person in the country to bail out the greedy now that they are in a bind, and the President and so many politicians are falling over themselves to go along with it - but with little tweaks here and there so they won't look too obvious. There's even a little debate about how to handle the future profits - profits?? - from flushing your billions into a Wall Street cesspool that no sane businessman would touch. Americans are outraged, but we're told to simply trust these very smart people in Treasury and the Fed who know how to handle this, the same gang who got us into this mess. Just trust them because they are much smarter than the rest of us. That's what I head Tim Ryan of Treasury saying this morning on Squawkbox. Fascinating. The massive corruption that has led to our current financial crisis will not be solved by handing the guilty all our wealth and giving them our financial future in the form of a credit card with a limit beyond imagination. No, that's not going to fix the real problem at all. But a few hundred crooks behind bars would be a healthy step. Throw in a truly independent investigation of the Federal Reserve Bank and their operations for fun to tell us what foreign powers or special interests have access to the secret decisions that are made and who has financial interest in their dealings, or . . . Ah, there we go, some of the mystique is back. Mmmm, I can almost taste the excitement of a night in the Skull and Bones crypt with some eerie Gaddianton-like oaths on the menu. Yeah, at least have the decency to keep this stuff secret and mysterious, not blatant and shameless. $700 billion without oversight to the former CEO of Goldman Sachs, who simply says "Trust me"? Couldn't you at least wear a black hood and talk with a heavy foreign accent when you make this ransom demand so we have to speculate about who this frightening agent of darkness is? Like I said, it takes all the fun out of conspiracy theories. Back to the shadows, now! Joseph Smith is said to have prophesied that one day the US Constitution would hang by a thread, and that the Latter-day Saints would play a role in saving it. His concern over the future of the Constitution was witnessed and recorded as early as 1840, and his statement about the Constitution in the last days eventually hanging "by a brittle thread" was given in a speech in May 1843, as recorded by James Burgess, long before two men wrote down what they called his "White Horse Prophecy" - now widely repudiated - that also spoke about the Constitution one day hanging by a thread. See "The White Horse Prophecy" by George Cobabe, made available by FAIRLDS.org. I say that only to remind you that there may be a legitimate basis for accepting the prophetic warning that the Constitution would one day be severely threatened, and that the Latter-day Saints would then need to rise up and resist its fall. Some of our critics make fun of us for keeping that statement in our lore when the alleged context, the White Horse prophecy, has been rejected as false. But the White Horse prophecy, however bogus, was not the source. So it's OK to accept that statement as a potentially valid prophecy. Might also be a good idea to look at what's happening and do something. Any of you folks ready to stand? We're staring at the most grandiose, audacious grab of power and wealth in the history of the world. Update, Sept. 20, 2008: It's now even worse than when I wrote this a couple days ago. Today President Bush has announced that he's asking Congress to take $700 billion more of your money to pay off bad mortgage-related assets. This will be another crushing blow to the national debt and to the whole concept of personal responsibility, individual liberty, and limited government. FANNIE MAE and Freddie Mac, the two government-supported mortgage giants at the centre of America's housing market, pose a particularly acute problem for the Bush administration. Not only are they too big to fail. They are almost too big to rescue. They hold or guarantee some $5.2 trillion of the nation's $12 trillion of mortgages, backed by the thinnest wafer of capital, meaning their collapse would imperil the already paralysed American housing market. Yet as Joshua Rosner, an analyst at Graham Fisher, a research firm, points out, nationalising them, a stark choice for the government since their shares tumbled last week, would "result in a doubling of the federal deficit, a further collapse of the dollar and unthinkable implications for the Treasury's cost of funding in the debt markets." This was done by a secret government involving the likes of the former CEO of Goldman Sachs, now the Secretary of the Treasury, and the Federal Reserve Bank, an unelected, unaccountable institution that has never been subject to an independent audit and is clearly contrary to the intentions of the Founding Fathers. They rule - and they decided that they needed to bail out some of their friends, at your incredible expense. Other bailouts of financial institutions have followed, removing the curative power of failure in allowing bad companies to reap the rewards of their greed and corruption. We will bail out many more organizations, allowing the government to take them over. It's nationalization of industry. It's national socialism, coupled with the insane deficit spending and inflationary policies that brought down the Weimar Republic and other nations. While these unelected officials continue their power grab over financial markets and carry out the most fantastic looting of a nation in the history of the world - stealing trillions of dollars from you, me, and our children, all in the name of "preserving confidence" and "for our own good" - the American people have been deluded into thinking that this is healthy. They feel grateful for the bold actions that their wise leaders are taking to help them out. It's like the people in Noah's time being grateful for the bounteous water supply that is coming their way. What's happening now, this week, this month, seems monstrously different than the corruption we've seen in past generations. It's dreadful. I don't mean that financial disaster will sweep this nation soon (though it could), but it is our liberty where the real disaster is. Unelected men seizing vast amounts of power and wealth. This isn't good. It's a tsunami of corruption and debt. But on the plus size, the Packers are having a great season, and I've officially become a Packers fan. So it's all good. Go Pack! But it came to pass that they did not pursue us far before they halted; and it was in the morning of the third day of the seventh month. And they rehearsed unto me the words of their mothers, saying: We do not doubt our mothers knew it. At that moment I thought of my own sons and posterity. I have four boys, plus a daughter-in-law and a granddaughter, and I may soon have another daughter-in-law. I recently took one son to the airport to go to Germany, doing an internship at the Max Planck Institute, and on Saturday had taken another son to the airport to go to Utah, where he enters the MTC on Wednesday for his mission in Taiwan. One last son is at home now, and he'll be off to college and mission before I know it. I'm entering late-stage fatherhood and my wife is entering late-stage motherhood, where parents go from worrying about how to get through each week with all the demands and activities -- soccer games, concerts, scouting events, buying school supplies, getting kids to do their chores, scheduling dental exams, etc. -- to worrying about the bigger picture. Will they marry wisely, will they be prepared to raise their own families, will the grandchildren stay true to the Gospel, will our posterity have liberty and will they remember their Lord and God? Add one more to the list: will they face the trauma of war? 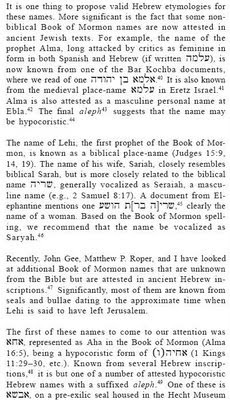 That's when it hit me: the Book of Mormon was written by parents. Not by a young single adult, newlywed, or even a young father (Joseph Smith and Emma would have a stillborn son in 1828 during the translation of the Book of Mormon) in the 1800s or even in 400 A.D., but by parents. Not any kind of parent, but by those in late-stage parenthood. The authors of the Book of Mormon have the perspective of fathers in late-stage fatherhood with a profound focus on the welfare of their posterity, with the worries and pains that come when there is weakness or sin in the lives of grown-up children (here I have to rely on my imagination), with the joys of seeing these children turn out well and succeed, with the constant concern for the generations beyond. That perspective was more remote and largely theoretical when we were trying to get a little sleep at night, struggling to decide which brand of disposable diaper really was best, or gasping for breath trying to get four kids to eighteen essential events every night. All this has changed now, or is changing, as we approach the empty nest (no, Mark, we're not kicking you out yet!) and begin working with a new generation. From the opening chapters of the Book of Mormon, with Lehi's passionate but hopelessly "out of touch" concerns for his wayward sons and his views of future generations, to the closing pages filled with perspectives from Mormon and Moroni about the future (including Mormon's earlier epistles to his son and fellow warrior and fellow minister, Moroni), we encounter a book rich in the mindset that late-stage parenthood brings. Alma the Younger's interviews with and admonitions to his sons are so much richer to me now. Alma the Elder's concerns over his son and his patient praying for God's help to bless that boy are so real now. Nephi's words and Jacob's resonate more clearly than ever. And reading Alma 56, I was transported into the mindset of the parents of those brave warriors from pacifist converted Lamanite families about to send their boys off into war. Think of the mothers, how worried they would be. When my father was sent into the hell of the Korean War, his mother, so worried for his welfare, prayed and pleaded for his protection. He wasn't fully converted to the Gospel yet. He needed time, he needed to come back safely, he needed God's protection. She consulted with her inspired bishop, who felt prompted to tell her that if she would be faithful, the Lord would spare his life. He would learn of this later, but during that war, he experienced many miracles where it was clear that the hand of God had delivered him (one example: an enemy mortar landed in his foxhole, inches from his back - a rare dud), and this began his own pondering and the remembering what his mother had taught him. This would lead to the growth of his faith and to a mission and temple marriage and yours truly being raised in a wonderful Christian home. Like his mother, the mothers of these young sons must have pleaded with the Lord and been inspired to offer an unusual promise to their boys: that if they would be faithful, the Lord would preserve them. The fathers weren't left out of the picture. Bound by an oath and unable to fight, they still wanted to or needed to do something to help. And so we see a rich supply of provisions - the first recorded care packages - sent from the fathers to their sons and the army they were with. What sacrifice and love must have gone into those provisions. Then reading of Helaman's words and the editorial choice to twice more remind us of their mothers and their faith - that's when it hit me. This is a book written by parents for parents, from a particular perspective that comes only after raising kids and seeing them go out into the world. The flavor of the Book of Mormon, across its centuries and numerous contributing authors, is that of a guidebook from mature, late-stage parents to their posterity and to us, a distant generation blessed by the faith of mothers and fathers who knew what loss and joy really are. By the way, please don't expect me to think that young Joseph Smith could have made all this up. There is a tonality and perspective that I can't see coming from a newlywed. That's open for debate, of course. But I suggest you come back to me after you've read it, pondered it, and have had a grandchild or two. Hopefully one almost as amazing as mine. What an awesome book this is - and once again, for me anyway, it's truer than ever. It's a breakthrough! I just did the math on the age of the earth with the help of the billing department in a major D.C. law firm. Take 7,000 years for a young earth, convert it to billable hours, and bingo - you get 5 billion years. The divide between young earth Creationists and modern science is a lot smaller than we thought! Who would have guessed that lawyers would be the missing link that brought harmony to science and some forms of religion? Personally, I'm an old earth guy, still clinging to religion as well as science, who believes that this incredible universe was created in a wise, orderly manner consistent with all empirical observations. It's far too clever and beautiful for anything else. I share some of my personal views on science and LDS religion on my LDSFAQ page: Science and LDS Teachings. Today I had the privilege of speaking with Ben Markham, a retired chemical engineer who recently served an LDS mission with his wife in Ghana. Ben has created an invention that is bringing light and delight to hundreds of children in Africa through his charitable organization, Empower Playgrounds. The invention is a merry-go-round connected to a special gearbox and power generator for charging LED lamps that can provide light in schools and in students homes so they can study more effectively. This non-profit adventure is just getting started and I'm sure Ben would welcome your assistance. I'm hoping some of my readers with deep pockets are reading tonight. "I'm doing this for no other reason than to help the children in Africa," Brother Markham told me. What a wonderful motivation for innovation. In Africa, Ben noticed that very few schools had electrical power, and that many buildings were just dark cement shells without lights and without many windows. He also learned that many students aren't able to graduate from school, partly because they have to do work on the family farm when they are home and there is light. By the time they have finished their work with the farm, it's dark. Without electrical lighting, even the brightest student will have trouble completing homework and studying at night. We can hardly imagine that being a barrier here, but millions are held back by the lack of lighting. Ben also noticed that few children in Western Africa had toys or equipment to play with. In fact, the initial motivation for Ben's invention was a desire to add some kind of playground equipment to schools. He wondered if a rotating device he saw used for wells could be converted into a merry-go-round, a novelty in his part of the world. But further discussion and thinking took him a step further to power generation, and then to rechargeable lighting. He worked with BYU-Provo and BYU-Idaho in solving some of the challenges in making these systems safe, reliable, and effective. The result has been highly successful. The kids love the special merry-go-round, and the power management issues have been worked out to provide effective charging when the equipment is revolved at typical speeds. And the kids love it. The merry-go-rounds draw a lot of attention and large crowds. Ben is pursuing additional innovation, working to develop swings with clever couplings for power generation and other playground devices that can help provide useful electrical power. His goal is to have entire sets of playground equipment that will allow him to provide power for larger schools. Right now they are focusing on small schools of about 100 to 150 children that can benefit from the power of a merry-go-round. There is much more to do. Ben could use your help. Here is a recent story: "Merry-go-round makes electricity" from the Daily Herald. Includes an awesome video. The organization's Website is EmpowerPlaygrounds.org. We all know this, but parents who do drugs really need a wake up call. A slap in the face, something, to get them to stop being such idiots. Shouldn't the first priority of parents be the welfare of their children? How is it that so many kids with drug abuse problems picked those habits or addictions up not from the rough crowd at school, but from the rough crowd at home? Anybody got a 2 x 4 to whack some sense into a few parents? That probably doesn't do any good when you're that far gone, I suppose. Not sure that's the Christian approach, either. Any suggestions?? A young woman with critical injuries is in a local hospital. I feel such pain when I think what she will face when she awakens. One moment she was happy, invincible, and having a great time with her friends. A moment later she lost control of her car, reportedly at reckless speed, and bolted across the median strip. Will she recall the terror of careening helplessly into oncoming traffic? Will she remember the late afternoon sunlight flashing off the metal and glass of the approaching Red Cross van, or the shock of its impact into the passenger side of her sideways vehicle before all went black? Her first question might be what happened to Hannah and James, her friends on the passenger side who took the brunt of the collision. When she learns that both are now dead, and that the others are seriously injured also, may God help her in her grief. We mourn for the dead and grieve with their families, as rightly we should, but sometimes the loss and pain experienced by the ones at fault may be far greater than we realize. I will never forget the pain and trembling of a man I met in Switzerland long ago who had just killed a pedestrian. It wasn't his fault, he wasn't speeding, but he had killed a person, and it was tearing him up. Perhaps he could have avoided it, perhaps he could have stopped faster, perhaps he . . . I hope he has moved on and found peace, but he said he felt like his life was ruined. His pain was great though there was probably little to blame. When the tragedy occurs through a moment of true stupidity and is clearly, undeniably our fault, how much worse the pain. It is easy think of punishment, to want the guilty to suffer, but sometimes they do, profoundly, without any need for others to rebuke them. My heart goes out to the families of the victims, but also to the one who was apparently at fault. Faith in Jesus Christ is essential for salvation; hope of eternal life through the forgiveness of sins and Atonement of Christ is essential; but without charity, without allowing God to change our heart so that we begin to love and serve others as Christ would have us do, we are incomplete. I Cor. 13 concludes with this statement: "And now abideth faith, hope, charity, these three; but the greatest of these is charity" (v. 13). When we awake, may the pain of our misdeeds and stupidity be long gone through the grace of Jesus Christ. May we instead be blessed to look back on our mortal life as an exciting adventure where we resisted the enemy of our souls and his pathetic temptations, all dross and foolishness, and instead repented of our sins, laid them upon the Lord, and followed the Author of our salvation, who helped us to bless the lives and save the souls of many. I think these are the kind of people to whom the Lord may say, "Well done, thou good and faithful servant: thou hast been faithful over a few things, I will make thee ruler over many things: enter thou into the joy of thy lord" (Matt. 25:21). Passing an arcane quiz on theology or Trinitarian metaphysics is not the ticket to joy in the presence of the Lord. That ticket might be more closely related to charity, a gift received through grace. I think it's the most important thing of all, more important than what Church you belong to or how accurate your theology is. May we follow that inspired counsel and turn to the Lord more fully, that He may help us to experience this miracle of charity. May we have charity for those who mourn and face terrible or even unimaginable loss. May we have charity also for those who cause us grief, such as the young woman in Appleton who may not yet know what sorrow and unimaginable loss she has caused. This is so difficult, so unnatural, so unspeakably divine - but not impossible through the power of Christ. Have you met my parents? They're great LDS people, fine Christians, and, based on the imperfections of their eldest son (yours truly), utter hypocrites. At least that's how the media would treat my Mom if she were running for office. If the poor choices of children make loving parents hypocrites, then I have to apologize for that hypocritical mother of mine. I've been amazed to hear college graduates and intelligent people simply repeat the rantings of the "stone her" crowd who call a woman a hypocrite because her daughter is pregnant. Hello? It's one thing to call a Christian a hypocrite when they are flagrantly violating their own religion by, for example, cheating on their spouse. But to call someone a hypocrite because a child erred? I think the real issue here is that a panicking abortion industry and its cronies detest the powerful pro-life statement made by a woman who would shun abortion and instead celebrate the humanity of a handicapped child by welcoming him into her life and support a daughter in respecting the sanctity of unborn life, no matter how embarrassing and inconvenient. Forget the ugliness of politics: it's time for all of us to speak up for the beauty and divinity of life. The slaughter of the unborn for personal convenience must cease. I marvel at the vulgar incivility of some members of the media, vitriolic forces steeped in partisan politics who proclaim that they are the arbiters of fairness and truth. These are troubling times. The partisanship is so blatant, a child can see it - but the educated elitists among us cannot. Are You Using the Maxwell Institute? The Neal A. Maxwell Institute, formerly FARMS (the Foundation for Ancient Research and Mormon Studies) has a wealth of valuable information relevant to LDS studies. Are you using it? Better yet, are you a subscribing member receiving their newsletter and other publications? If you go to Publications, you'll find the Journal of Book of Mormon Studies, the FARMS Review (mostly reviews of books, including many hostile ones), Occasional Papers, Insights (a newlsetter), Transcripts, Book Excerpts (many outstanding books are there, including the complete book in many cases), Translations (of FARMS articles in several languages), Multimedia (videos and recordings of some great lectures), Bookstore (you can buy stuff), and BYU Studies, where you can even find some great free copies of some publications such as the classic 1969 articles by John Welch, Chiasmus in the Book of Mormon (a PDF file). I especially love the Journal of Book of Mormon Studies. No fair denouncing the Book of Mormon as a pile of embarrassing rubbish if you haven't spent some time there.